Santa Barbara Parks and Recreation gave a presentation on local trees and their future in Santa Barbara last Thursday, Jan. 24. Speaking to a small group in the Faulkner Room of the Santa Barbara Public Library, SB Parks and Recreation offered the public information on the “Urban Forest” in the local community. “Urban Forest” refers to the collection of trees, shrubbery, and other forms of plant life that grow throughout SB and help ensure the aesthetic and environmental value of the area. Fred Sweeney, a local architect, agreed that trees play a key role in perception and feeling of the SB area. 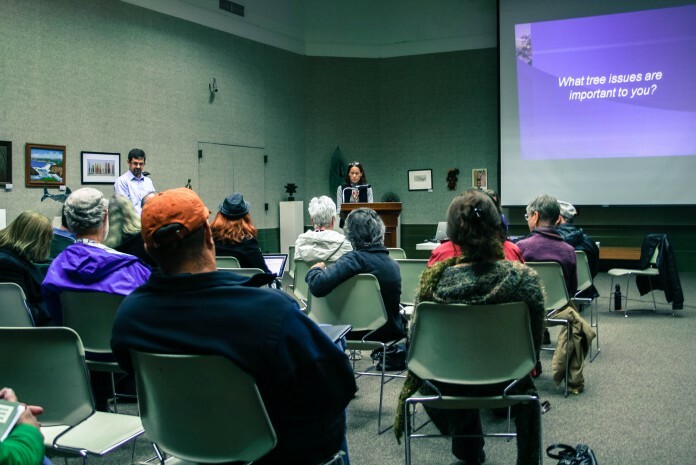 While Parks and Recreation did occupy a portion of the meeting giving information, a key goal of the event was to hear from community members their concerns and questions regarding the SB urban forest. Sheila Lodge, a previous mayor of SB and currently the Planning Commissioner for the city, said she’s concerned the public doesn’t understand the value of the urban forest. One concern raised was the issue of non-native trees overtaking those native to California. Native plants on average use less water, require less maintenance, are naturally defensive against local pests and diseases, encourage local wildlife to live there, and help support the local ecology, prompting the SB Parks and Recreation to promote their increased prevalence amongst local gardeners and homeowners. The Parks and Recreation committee asked those present to offer visions on what they hope the urban forest will look like in the next several decades. Sweeney said the balance of local and non-native trees is of great importance. Other community members suggested doing their own part to ensure the future. Alice San Andres Callejo, community organizer for the Mesa, said she’s trying to coordinate street teams throughout the Mesa that would have some form of fruit tree in their front yard, simultaneously improving the environment and the view as well as reducing how much the families spend on produce. San Andres Callejo stressed the importance of community involvement.